In 1885 Peaked Mt. (MZ1556) was documented as a drill hole in a triangle on the pinacle of Peaked Mt. In 1896 Peaked Mt.2 (MZ1557) was documented as a drillhole in a triangle and a circle. A disk was later placed in that drillhole. There is another drillhole 10'10" west of the MZ1557 disk but it is about 6" below the disk. I've spent a bit of time looking for MZ1556 and since a drillhole in granite is hard to destroy I'm sure that it is still there. I think that MZ1556 and MZ1557 are both the same. I would like some other opinions on this subject. The way the description for MZ 1557 'Peaked Mountain 2' reads, it is about 10 feet west of MZ 1556 'Peaked Mountain'. MZ 1556 is a drill hole with a triangle around it, while MZ1557 is a drill hole with a triangle around it then a circle around the triangle, with a disk added later. Maybe there is some part of the 'circle' still showing out from under the disk. MZ 1556 should be 10 feet east of the disk, so that should narrow down the search area. Here is a good picture showing the triangle and circle around MZ1557. The discription said that it was on the pinnacle of the moutain. Ten feet east puts it almost 4' below the pinnacle. I have looked in that area some with no luck. The trustees don't want us disturbing the soil to much if possible. As you know, sometimes the discriptions are a little bit off. This one is confusing. MZ1557, PEAKED MT 2 is First order Triangulation. NAD 83(1996)- 42 02 50.77537(N) 072 20 24.68424(W) This should be accurate to within a half inch. You can see the Station Coordinates are different. There are in fact, two stations there, and within 6-10 feet of one another. They are not the same. Interestingly and of note, The Geodetic Surveyors who described Peaked MT 2 in 1901 mention finding Station Peaked Mountain, but they did not submit an official recovery for it at that time. Station Peaked Mountain has not been officially recovered since 1885. Ok so here you go. I see you have already done most of this but here is how anyone could do it. Go Find MZ1557, PEAKED MT 2, set your GPS To NAD 83 Datum, Degrees Minutes and Seconds Format, dddmmss.s, Then set it up to do a Go To, to 42 02 50.8 (N) 072 20 24.7(W) rounded up to nearest decimal. When one finds it, please take a photo of this station as it is of a very rare type You will know one when you see it as it has a star of david type star in the center of it instead of the usual triangle: THIS IS AN OCCUPIED FIRST-ORDER STATION MARKED BY A STATE SURVEY STANDARD MAGNETIC STATION DISK STAMPED PEAKED MOUNTAIN 2, 1896 SET IN A ROCK. I have confirmed this from the photos in your recovery last year. This is a station that was at one time used to measure the Earth's Magnetic Field. Those were a pretty rare type of Station. Congrats on that. 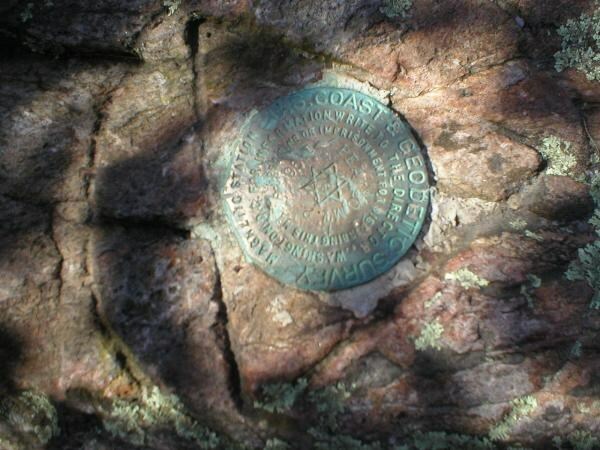 Hunters Should find The Station Mark, RM2 and RM3 as brass discs cemented in drill holes. You did find the station RM1 and 3. You should find RM1 as a shank with a pried off disc in a drill hole, still fully functional as an RM in that condition, and RM4 was never monumented as a Brass disc, but it should still be there, it is a drill hole 23.26 Ft or 23 feet 3 inches, bearing due Northwest of the Brass Disc Station Mark called PEAKED MT 2. No one has recovered RM4 since 1977... No Geocacher has submitted a clearly legible photo of RM2, and no photo for RM4 as yet. All four of the reference marks are easily verified with a compass and a 50 foot tape measure, you could get by with a 25 footer if you skip out on doing a direct measurement to RM3. A helpful hint here, if you do find RM4, it could be indicative of what Station Peaked Mountain may really look like. To find PEAKED MOUNTAIN, PID MZ1556, take your tape measure with you and an Ice Pick or leather Awl, if you have one, a 16d nail if you don't. A stiff putty knife could be helpful, and a compass calibrated for Magnetic declination (Declination = 14° 52' W changing by 0° 0' E/year) will help too. From the Station Disc Peaked Mt 2 pull your tape measure out 10 feet due east (True) of the brass disc and if you have chalk, or something you can lay down at the location there like a small rock, make 2 marks one at 6 feet and one at 11. Then while holding your tape measure on the station disc, sweep the tape measure to the south and stop when you get to the Due Southeast Direction. Again make a mark at 6 feet and 11 feet. Somewhere inside that pie shaped box, based on the differences in the two coordinates I would say ESE of the Station Peaked Mt 2, should be the Station Peaked Mountain, A drill hole. Now, I know you found a hole to the west of Peaked Mountain 2 that you thought might be the drill hole for Peaked Mountain, but lets compare the station coordinates. Do you see how the numbers are larger on Peaked Mt 2 than they are for Peaked Mountain? Particularly to the right of the decimal point? This means that Peaked Mt 2 is slightly further north and west of station Peaked Mountain because when dealing with North Latitudes, the numbers are larger the further north of the equator, and and with West Longitudes, the numbers are larger as you go west of Greenwich England. Some people may not realize this but comparing the numbers can give clues to direction and distance. Since Peaked Mountain is a smaller number in both axis's I believe it is ESE of, meaning a greater distance east than south of Peaked Mt 2. Even the CGS described Station Peak Mountain as being 10 feet east of Peaked Mt 2 in the 1901 recovery of Peaked Mt 2. That concurs with what the coordinate comparison seems to say. It may sound silly to be described as being on a pinnacle, but it was not described as being on top of the pinnicle. The 1934 recovery seems to indicate that where the station would be is 3-4 feet lower in elevation than Peaked Mt 2. If it is not obvious, take your awl and putty knife and dig and scratch around inside the pie shaped area you laid out, it should be there. You should by rights see the chiseled triangle even if you don't see a drill hole. But like I said, perhaps full of soil or overgrown with lichen. If you find it, and it may not be easy to see it first, you will be the first to do so, officially, since 1885. This is what the Station Coordinates, taken in comparison tell me, and if accurate it should be right, but we find errors all the time. Sometimes numbers become juxtaposed, subtracted instead of added and all sorts of things... I agree with your statement, "a drillhole in granite is hard to destroy I'm sure that it is still there". I think so too. It is possible that it could be not located but it isn't destroyed. One thing that could be done to help future recoveries of the drill hole is to take distance measurements with bearings from the various brass discs in the area (at least 2, 3 would be better) to the drill hole which is Station Peaked Mountain, and in so doing, recording the results to the description of MZ1556 Peaked Mountain, so it can be improved for future use. From here I see the need for a good photo recovery of RM2, and a recovery for RM4 on PID MZ1557, and a recovery of any kind needed on MZ1556. Both for Geocaching, and even for the NGS if one likes. If for no other reason than to find it as a find for geocaching, this should help. I hope someone can explain this observation: If you go back through the NGS data sheet values for "superceded control" for both marks it looks like they are moving toward each other over the years. I expected the location of a mark versus one many miles away would change some as the earth model was updated, but two marks that start out a few feet apart should remain the same distance within practical measurement limits. No? I used a second of latitude as 101.5 feet, and at N42 02 a second of longitude as 75.4 ft. So subtracting the NAD27 coordinates gives 0.017 second south from MZ1557 to MZ1556 and that would be 1.72 ft, and 0.149 second east or 11.99 ft, for a diagonal of 12.1 ft or 3.7 meters. The 1986 values are a lot closer, and the more recent ones a trifle closer yet resulting in the 1996 values being only 0.00169 sec south and 0.00348 sec east, or 3.8 in apart. Who can explain what these updates really mean? Are they a re-computation from (old) observed angles, or only an adjustment for the earth model under them? Next stupid question. Why would they set a new mark at MZ1557 if they found the one at MZ1556? Wouldn't it have made more sense to just make new measurements from a point already described? Are we supposing that they couldn't find MZ1556 in 1896 but did in 1901 (and then not in 1934)? Bill93 - You've noted an error that I will have to have Casey the new NGS liaison look into. The positional differences in NAD 27 are 3.694 m, while in NAD 83 it's only 0.096 m. -- this could only have happened if there was an error made in the automation of the trinangulation observations back in the late 70s when these data were being put into the data base. Since this has not be previously reported to NGS it shows how often this station has been used for any serious survey work. Yesterday I went up the hill and shot aizmuths from MZ1557 station marker to the three RM's. Rm1 was 185 degrees, RM 2 was 286 degrees and RM 3 was 45 degrees. The 15 degree declination is built into these bearings. I may be off a few degrees but its close. The aizmuths in the discription are RM1 is 09 degrees 35 min 07 sec., RM2 is 106 degrees 07 min 49 sec and RM3 is 221 degrees 28 min 11 sec. These are the back aizmuths or mirror image of the ones that I took.